In 1872 Reading boasted of a literary publication which bore the caption “Reading Lyceum Review.” It was neither magazine nor newspaper, but rather a combination of both. In its November issue one who signed himself as “H.W.Z.” related the story of the witch of the Schuykill. Because of its local setting the tale may be of interest to Scholla readers. A beggar approached a group of newspapermen in Reading and asked for a pittance. The gentleman of the “fourth estate,” ever anxious for a scoop wand with noses for news promised to meet his request provided he would tell a good story. Accordingly, he regaled the scribes with the following account. Early in the 19th century there lived an elderly woman, known to the Berks residents as “Dame Ellen.” Her home was on the banks of the Schuykill River, on Green Tree Road, near Green Tree Tavern: According to “H.W.Z.” she was an “an attenuated female of most hideous countenance, ogle-eyed and crooked-kneed” all of which means that she was ugly. There were stories of her rides on a broomstick with her demon lover; of the orgies of her feast on the occasion of the Witches’ Sabbath; of the farmer’s milk that sour when she passed his barn; of thefts and depredations of all sorts that were charged to her evil incantations and of the evil eye and other manifestations of sorcery. She gained her livelihood by telling fortunes of the credulous and by light-fingered pilfering at public gatherings. This income was supplemented by the produce from her small garden and charitable gifts of cast-off clothing and the like. One day Dame Ellen was missed by some of her neighbors. They had not seen her stir about her garden the blinds and shutters of her house were in the same position for weeks on end and something must be wrong. A group of young men decided to investigate. They approached her house and shouted “Hail, Evil One.” There was no response. Braving the wrath of the spirits the men entered the house and found the partly decomposed body of the unhappy woman. Placed upon a table, alongside a spirit lamp there lay a sealed packet. The investigating neighbors opened the packet and found, therein, the sad story of Ellen Hurton’s life. She had been reared near Providence, RI. Disaster beset her family when she was quite young and all of her relatives had perished in an epidemic. Alone in the world she had accepted marriage to a coarse drunkard who beat her and disfigured her features by his cruel tortures. Although almost penniless she had left her New England home and had built for herself a hermitage on the banks of the Schuykill. There she had been forced to eke out an existence by methods which had earned her the title of the Witch of the Schuykill. Archival Notes: It is well documented that there was a Green Tree Tavern on the northwest corner of 6th and Penn Streets. Later owners renamed it the Keystone House, and the property eventually became the site of Hotel Penn. The article says that she lived near Green Tree Tavern on Green Tree Road, but 6th street’s previous name was Prince Street. Which makes this archivist reluctant to name that as our tavern in question. Further information provided from the township of Cumru mentions a Green Tree Tavern. “Schuylkill Road, opened in 1750, followed along the Western bank of the Schuylkill River by way of Plow Tavern and Green Trees Tavern through Cumru, Caernarvon and Robeson Townships.” ( http://www.cumrutownship.com/home/historyofthetownship.html ). By Researching Plow Tavern in the Passing Scene vol. 14 pg. 186 George Meiser IX provides us that Schuykill Road is now Route 10. As to the particular location, due to time constraints I must end my investigation. Anyone who is interested please pick up where I left off and feel free to provide your answer in the comments section. Thank you! Have a great weekend! 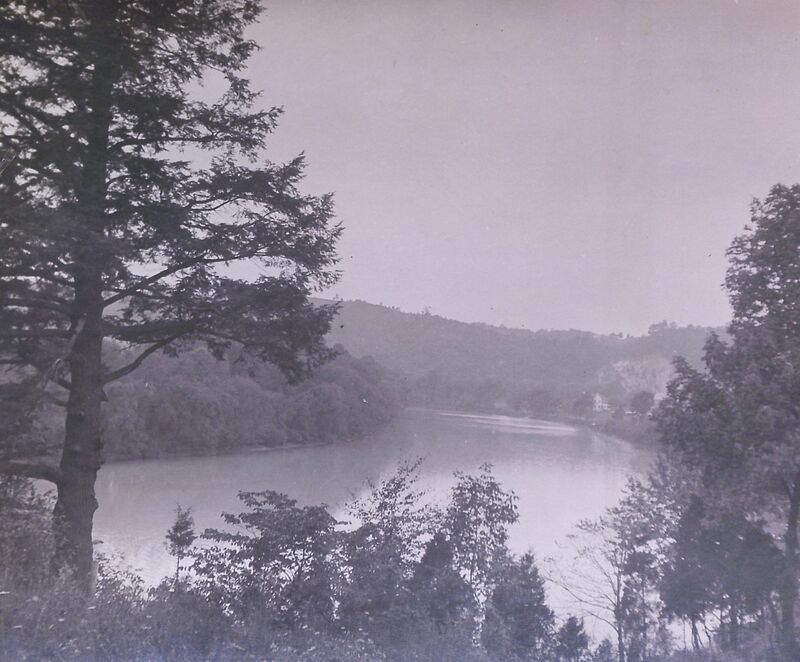 View of the Schuykill River Courtesy of the Berks County Historical Society.